106/123 David Mumpower I might have loved this movie when I was 8. Alas, I haven't been 8 for a while. 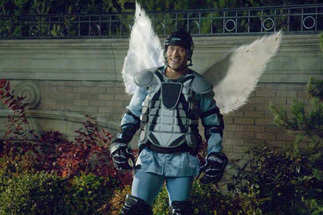 In the highly plausible category of film ideas, Dwayne "no longer The Rock" Johnson stars as a tough guy minor league hockey player in Tooth Fairy. That’s not so unrealistic considering he has acted as an athlete in many films. The part that is a stretch is when Johnson’s character Derek Thompson is sentenced to be the tooth fairy for a week as penance for a bad deed (presumably made on the ice). I’ll take a wild guess and say that he knocks somebody’s tooth (or teeth) out to receive said punishment. Ashley Judd and Billy Crystal co-star in the comedy based on the tiny winged one. It’s directed by long-time television Director Michael Lembeck, who is also responsible for helming the second and third portions of the big screen trilogy The Santa Clause, which starred Tim Allen. Johnson, a former University of Miami football player, has had his share of successful films. Cutting his acting chops on the stage that is known as professional wrestling, he signed the biggest first-time acting payday ever for starring in The Scorpion King back in 2002, hauling in $5.5 million for his work. A spin-off of the successful Mummy franchise, The Scorpion King earned $90 million domestically. He has since broken the century mark stateside on two occasions, leading 2007’s The Game Plan to $110 million and supporting Steve Carell and Anne Hathaway in 2008’s Get Smart, which has hit $130 million domestically. With The Santa Clause 2 and 3 earning $139 million and $84 million respectively, Lembeck has seen films hit before. But Clause was an established entity after the success of the original pic earned $144 million in 1994, eight years prior to his coming on board. Both of his sequels earned less money and were more reviled by fans, seeing the original sequel at 5.5 on IMDb and the third entry with a dismal 3.8 IMDB rating. Santa Clause 3 failed to deliver the goods in that regard. Also, the writers of Fairy have some experience in the attempted comedy genre having penned the aptly titled Surviving Christmas, a movie you literally had to survive to make it through. It earned only $11 million in North America despite having a known star in Ben Affleck. See the latest developments for this project on the Tooth Fairy Movie News page.